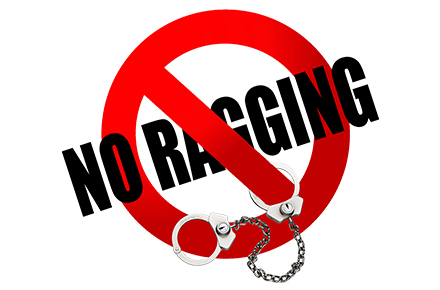 Ragging is a social evil and criminal offence under provisions of Indian Penal Code (IPC) and students should not indulge in any form of ragging in or out side the campus. VFSTR being a follower of high ethical standards and values has been turning out professionals of high caliber with strong sense of ethical judgments, social integration and leadership is committed to prohibit, prevent and eliminate the scourge of ragging. "Ragging in essence is a human rights abuse... In present times shocking incidents of ragging have come to the notice... The student is physically tortured or psychologically terrorized..."
... Ragging adversely impacts the standards of higher education ..."